100+ pictures of Avril performing at Q102's Jingle Ball in Philadelphia, PA last night. Avril later tweeted "Omg played a radio show tonight, can't believe how much the game has changed, we were one of the few bands that actually played live WTH". As long as she plays live, thats all that matters! Here are Avril's segments from the Rachael Ray Show (ripped from their website). Do you think a cooking show is in Avril's future?? Aww Avril likes getting fanbooks :) Hope she liked the fanbook you all helped make for her! Here are some sneak peak pictures of Avril's appearance on The Rachael Ray Show which airs on December 7. On the show, Avril brings her holiday recipe for "Uncooked Chocolate Cookies" - and a gift when she stops by Rachael's kitchen, she shares her holiday memories and shows off some of her other talents besides singing, and performs her latest single, "Wish You Were Here." Looks like it's going to be a really fun show! Avril was spotted out with her ex-husband Deryck Whibley last night at Madeo Restaurant. They were accompanied by Amie, but no Brody Jenner in sight. Were they maybe celebrating Sum41's recent Grammy nomination? Thanks Avrilsmusic for the pictures. By the way, ignore what the paparazzi who did this video is saying - he has NONE of his facts straight. Avril and Brody are still together. Can't 2 friends, who just so happened to be married have a night on the town? Sheesh. Before they hopped on a plane to go back to LA, Avril and the whole crew were spotted walking around New York City, laughing and looking like they were having a great time. 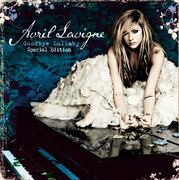 Japan will be releasing a Goodbye Lullaby Japan Commemorative Limited Edition CD+DVD on December 21 to celebrate Avril's concerts on The Black Star Tour in February 2012. There are no new tracks (just additions), but the cover is slightly different. Another one to add to our collections! Avril tweeted this ADORBALE picture from the set of The Rachael Ray Show today. "Check out the new Abbey Dawn apron that I designed for The Rachel Ray Show"
Avril and Brody were spotted leaving "Live with Kelly" earlier this morning after Avril performed Smile and Wish You Were Here. Thanks Avrilsmusic.